Dan Ferrone was a member of the Toronto Argonauts and the Calgary Stampeders during his playing time in the Canadian Football League (CFL), playing a total of 213 games in his career. 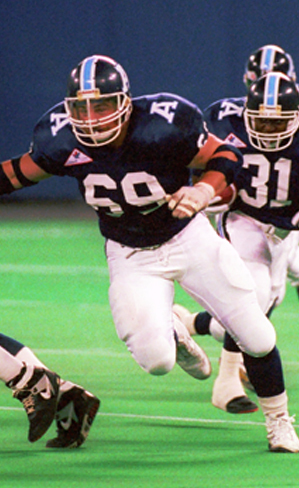 Ferrone retired as the eighth all-time Toronto Argonaut with 175 career games played. In 2002, Dan became the Toronto Argonauts offensive line coach and in 2003 the team’s president. In 2006 Dan was named as an All-time Argo and in 2007 he also was named to the All-Time Argo Team list as a guard. In addition to being a 10 year Argo captain, Dan was also a ten-time team nominated Outstanding Lineman and two-time league finalist. Dan was also the President of the Canadian Football League Players Association (CFLPA) from 1993-2002. Dan is also a member of the Oakville Sports Hall of Fame inducted in 2000.